Welcome to Day 1 of our mini-study, In God’s Presence. Our blog will be a place you can visit each day to find a daily devotional, scripture reading, and further study (weekends are catch-up time). We are honored to have over twenty women share what they have experienced in His presence personally. Today, our very own, Donna Fender shares a most profound statement and truth, In God’s presence, there is God. Her eyes lit up the first time she shared this thought with me and I knew that we were in for something special. I agree with Donna, in God’s presence there is God. Let’s journey together this month and grow to discover what this means and all that can be found in His presence. As I walked down the hall, I knew that it was not good. “Donna, you are one of the best therapists we have but…..I just don’t know where you are. Your heart is just not in it lately.” I had just returned from maternity leave, after twelve weeks at home with my baby. A very good friend of mine was caring for her and I had arranged to have Friday’s off. I had spent seven years in school to become a physical therapist and my boss was right…my heart was not in it. My heart, at the time, was at my friend’s house with my sweet baby girl. Have you ever been somewhere but not “really” been there? Is there a time when you felt that you were lacking something, something that you thought you were seeking but you couldn’t find? 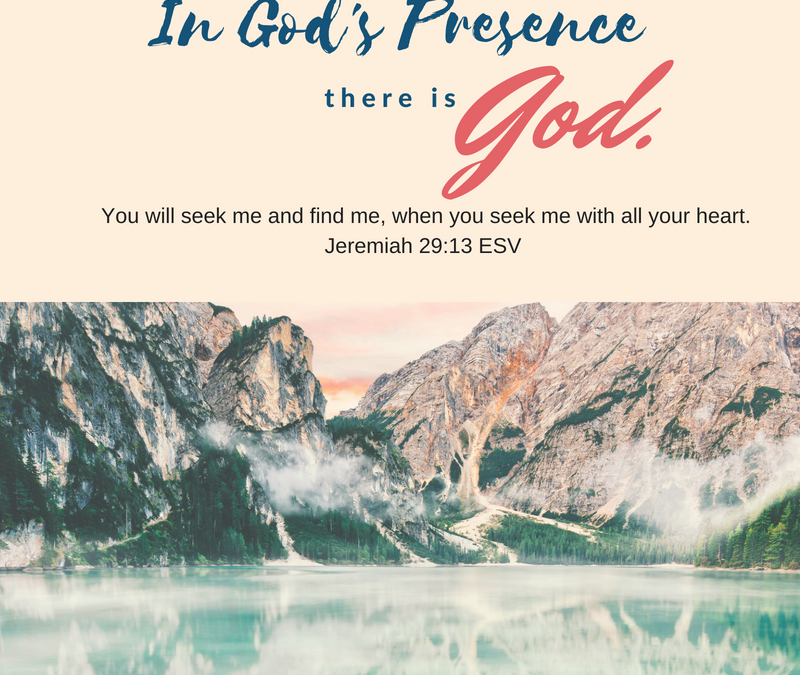 Has your heart ever “not been in it?” Jeremiah 29:13 says “You will seek me and find me when you seek me with all your heart.” Over the next few weeks, we will be studying about God’s presence. We will be looking to see how we can find fullness as we draw near to God. We will discover beautiful things that being in the presence of God will bring. And we will begin with this…IN THE PRESENCE OF GOD THERE IS GOD. 1 Peter 2.9 says this “But you are a chosen people, a royal priesthood, a holy nation, God’s special possession, that you may declare the praises of Him who called you out of darkness into His wonderful light.” When we become followers of Christ, we never lose the reality of God’s presence. We have been called and chosen to BE the light, not just hold a light. We shine through Christ, seeking His redemption to share with the world because in the presence of God, God is there. When we are alone in His presence our hearts learn to worship Him for all that He is….yesterday, today, and forever! I called my mom in tears. “What should I do?” I asked. “Quit”, she replied. “You and Justin will figure it out.” Follow His lead…He will take care of the rest. God was there that day because God was there when Justin and I married. God was there that day because God was there when we brought our firstborn into the world. And God was there that day, in that office when I left for the day and didn’t return for a few years. And He provided…as He always does for those who seek Him. 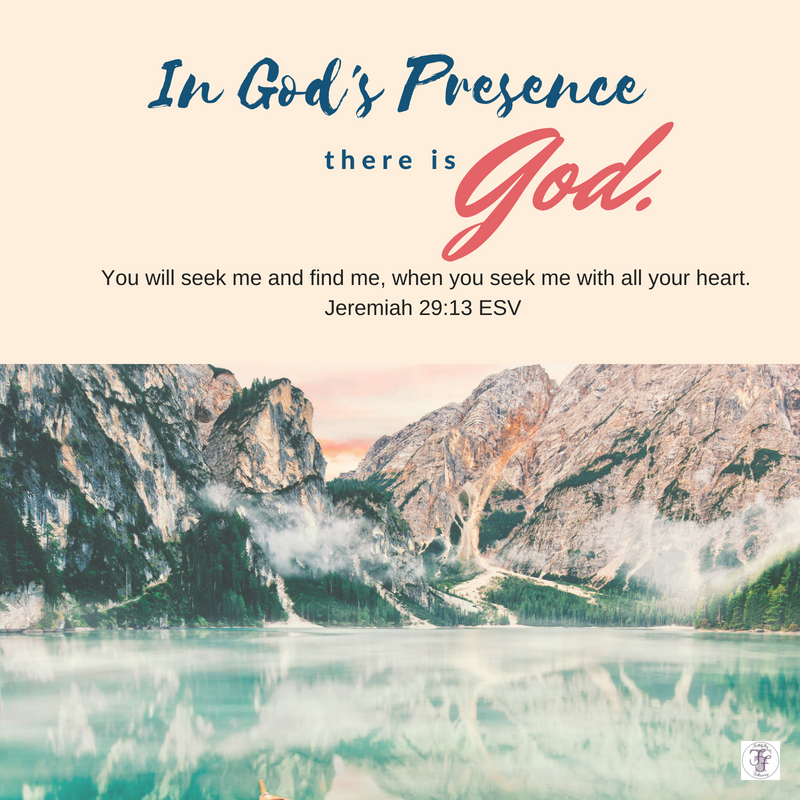 In the presence of God…God is there! Grab a notebook and your bible to use throughout the study over the next few weeks. Use Donna’s scripture list above to start your notes. Look up each verse and read it searching for evidence of what is found in God’s presence. Leave room to add to this list throughout our study together. Write these verses in your notebook, underlining in verse 28 the three things we have in Him. How does it impact you to read in his word that we live, move, and have our being in him? Does this motivate you to seek the Lord with your whole heart as instructed in Jeremiah 29:13? Discover what God’s word ensures His children in Matthew 28:20, “I am with you always”. Pray with us asking God to help us see and experience Him in new ways, thanking Him for making a way into His presence. We hope you join us each day. The journey is always sweeter, together. Beautiful reminder of no better place to be than in His presence. I have been at the cabin for the past 5-6 weeks. I leave tomorrow with sadness because I know I will not feel God’s Presence in OKC the way I do here. But also know I have to pay more attention there. God’s presence is everywhere, the deer grazing in the yard, fawns playing. the call of wild turkey with their young, The smell of rain50-200 ft blue spruce. The brilliance of the night sky. Here I can hear His voice riding on the wind in the treetops. I am grateful for this visit. My mind is clearer. I understand more of what he wants for me and there are peace and contentment in my heart. I was just studying Seeking His Face this mornig before I even got to this study ❤ I Love how He keeps lining up scripture! It’s so wonderful when that happens Jenni. It’s like a little smile and hug from God. Came into this study this afternoon with a open heart seeking God’s presence in my life. Thankful to be here with you girls! Connie, we are so glad you came with an open heart. May we each do the same. Welcome! As I wrote each of the scriptures down, the words in Zephaniah that “He will take great delight in you”, made me sigh. Why is it I find that so hard to believe? It is my prayer as I study more here about being in His presence, I will finally come to rest in that truth.